According to Brides Magazine the average cost of a UK wedding is a whopping £24,000. Of course, if you’ve found our site you will realise that you don’t need to spend over the odds to achieve style, quality and elegance. If you want to achieve your perfect fairytale wedding but don’t have a huge budget to blow then this week’s blog is perfect for you. Here are a few of our top tips to help you get the most from your money. The UK has two world-famous jewellery districts; Hatton Garden in London and Birmingham’s Jewellery Quarter. There are some great bargains to be had at these precious metal dealers, so we’d definitely recommend a visit to them if you’re starting your search for an engagement or wedding ring. You can also find some real gems (pardon the pun) in vintage and antique shops, particularly if you aren’t in a rush to source your perfect piece. Choosing less popular days can cut the cost of the reception venue by up to half. You are also more likely to receive discounts with photographers, florists, car hire and hotel rooms. When opting for less popular days we recommend giving your guests extra notice so they are able to book time off from work well in advance. Our Sweet Love Wedding Invitations are part of our budget range of wedding invites. 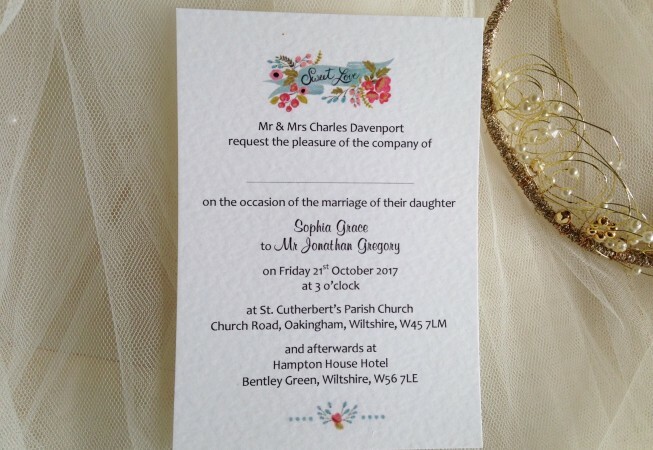 At Daisy Chain Invites, we supply a huge range of wedding invitations and wedding stationery that starts from as little as 60p per invite. All of our invites are high quality and we make and dispatch all orders within 3-4 days. With such low prices you can get beautiful invites without the hassle of attempting to make them yourself. To accompany your invites, we can supply guest information cards, these cards are great for adding gift poems and other useful information. Our website provides wording ideas if you would like to ask for cash but aren’t quite sure on how to word your request. Food, along with drinks, will undoubtedly be one of the largest expenses of your wedding. Another way to reduce the cost of food is to have your ceremony later in the day, followed by one big meal, rather than the standard two. A great way of cutting the cost of your wedding cake whilst still achieving a personalised design is to buy a simple cake and decorate it yourself. There are a huge selection of cake decorations available online and one of our personal favourite stores for great tasting wedding cakes is Marks & Spencer. 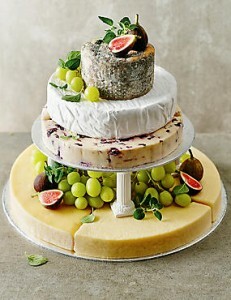 If you’re after something a little different check out their cheese celebration cakes that can double up as the final course of your meal. Check what is in season before starting to consider your wedding flowers as seasonal availability will affect the prices of your flowers. If you have a creative member of your family, then enlist their help and hit your local markets for ideas as this can be a great place to get excellent value for money. If you are decorating the church with flowers, consider asking your friends for help in moving the flowers from the church to your reception venue after the ceremony. Finally, be realistic about your budget. Whilst your wedding day will be a momentous occasion, it’s also important to note that financial pressure from debt is one of the biggest causes of divorce.